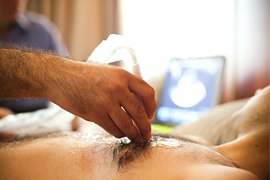 Echocardiography is a painless test we use to view your heart. By using non-invasive sound waves, Beverly Hills cardiologist Dr. Jamshid Maddahi will be able to view your heart while in motion and observe its function. This tool is an excellent choice to view abnormalities in the shape of the heart whether they are congenital, due to a heart attack or lifestyle choices. Weakened heart muscles, leaking valves, blood clots or tumors in the chambers of the heart and arteries will show up on the echocardiogram. Using Doppler ultrasound, Dr. Maddahi can see the movement of blood as it passes through the different areas of the heart. By viewing the heart and blood in motion, Beverly Hills cardiologist Dr. Maddahi will be able to diagnose heart problems, see if current treatments are improving the function of your heart, or decide if further testing is needed. The test will take our office approximately one hour to complete. During the test, a bit of gel is placed on your chest, and a hand-held wand called a transducer is passed over your torso. You may experience some pressure as the transducer is passed over your chest. Let us know if you become uncomfortable at any time. You should take your medications as you normally would and you may eat before the test. We will dim the lights so that we can see the image on the monitor easily. Your test results are recorded and viewed by Dr. Maddahi. There are no known side-effects to echocardiography. Although the test appears simple, the cutting edge technology of echocardiography provides a wealth of information. The power of the technology in echocardiography is multiplied by the experience of the doctor reviewing your results. Beverly Hills cardiologist Dr. Maddahi is sought by fellow cardiologists all over the world to analyze test results for their patients. You can be confident that your test is reviewed by a world-renowned specialist.